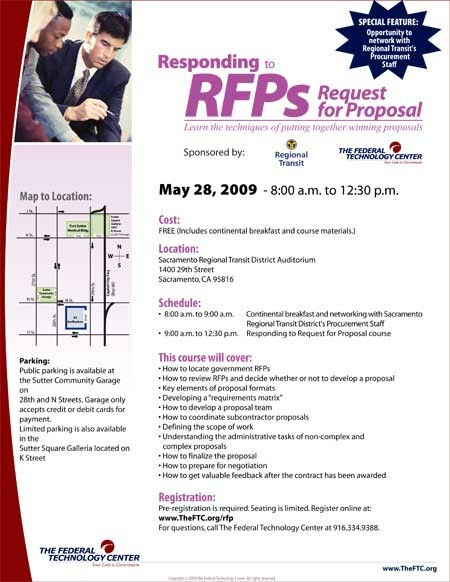 The fair will enable vendors, especially disadvantaged, small and disabled veterans businesses to meet Caltrans purchasers, and have an opportunity to network and sell their products. Click here for the list of commodities and services that MAY be procuring. 32nd Annual Dinner - Save the Date! Keynote Speaker Gregory C. Farrington, Ph.D., Executive Director, will present the vision and reality of integrating architecture, science, and the culture of sustainbility. 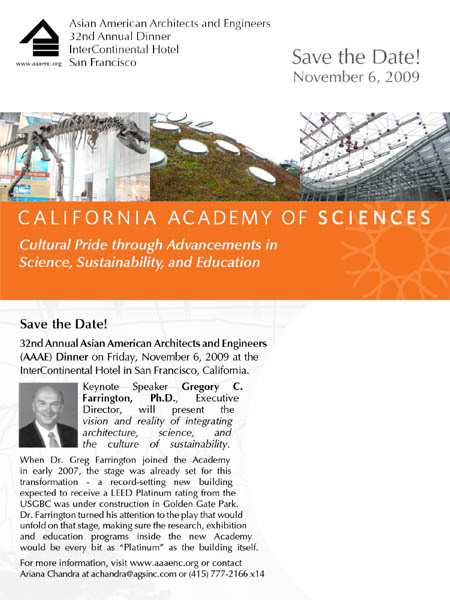 When Dr. Greg Farrington joined the Academy in early 2007, the stage was already set for this transformation - a record-setting new building expected to receive a LEED Platium rating from the USGBC was under construction in Golden Gate Park. Dr. Farrington turned his attention to the play that would unfold on that stage, making sure the research, exhibition and education programs inside the new Academy would be every bit as "Platium" as the building itself. Click here for the Save the Date flyer. AC Transit staff will offer tips on the agency's procurement process and provide an overview of upcoming contracting opportunities in the areas of construction, professional services, and the purchase of equipment, supplies and materials. AC Transit lines 1, 11, 12, 15, 18, 51, 72, and 72M stop one block away on Broadway at 17th Street. BART 19th Street station is also one block away. Paid parking is available at Franklin Plaza Garage (19th Street between Franklin Street and Broadway), and at Downtown Merchants Parking (1316 Franklin Street). If you have questions or need more information, please contact Anne Fudge at afudge@actransit.org or (510 ) 891- 4733. We hope to see you on November 10th! Attention Alameda County Construction Contractors: You are cordially invited to attend a grand event to kick off the NEW Alameda Count Contractor Bonding Assistance Program (flyer attached). This event is FREE OF CHARGE and will take place on Thursday, October 8th , 2009 at Martinelli's Event Center in Livermore. Join us from 8:30 to 11 am for networking, program information, refreshments and prizes!! 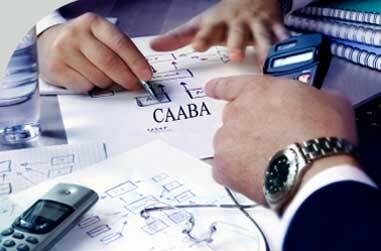 As a local or small local contractor, this program is geared to help YOU! Be sure to RSVP and DON'T MISS OUT! This is a unique opportunity to get the information you need to move your business forward. Please open the flyer for more information. "Stimulating Small Business Growth in the Current Economy"
The economic recovery depends and will be driven in large part by small businesses. This workshop will provide information on how small business owners can access the credit they need to support an economic recovery. RSVP @ abaofsv@comcast.net. The cost to attend is $5 and refreshments will be provided. MEMBERS – FREE* All AAAE Members who RSVP and have Paid 2009 Membership Dues. NON-MEMBERS – $45* All Non-Members and Guests of AAAE Members who RSVP by June 18, 2009. LATE REGISTRATION FEE – ADDITIONAL $10 All AAAE Members and Non-Members who RSVP after June 18, 2009 and/or register at the event. Click here for flyer and RSVP form. BART will host this informational meeting to provide an update on its plans to reinstate DBE goals on federally-funded construction contracts. If you would like a copy of the Study prior to the meeting, let us know and one will be emailed to you. You can also download a copy of the Study after May 4, 2009, from BART’s website, www.bart.gov/ocr. Direct questions to Bendu Griffin, bgriffi@bart.gov or to 510-464-7657. 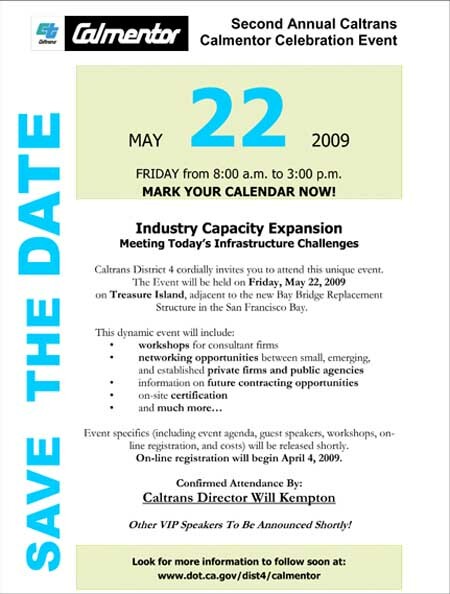 To confirm your attendance, please complete the registration form and fax it to 510-464-7587 or email information to bgriffi@bart.govby close of business Wednesday, May 6, 2009. Caltrans District 4 cordially invites you to attend this unique event. on Treasure Island, adjacent to the new Bay Bridge Replacement Structure in the San Francisco Bay. Event specifics (including event agenda, guest speakers, workshops, on-line registration, and costs) will be released shortly. On-line registration will begin April 4, 2009. For questions, call The Federal Technology Center at 916.334.9388. You are cordially invited to attend the AACA 2009 Annual Dinner! NEW!!! A "silent auction," with many wonderful prizes!!! Please remember to make your reservations no later than March 7, 2009. We look forward to seeing you all there at the dinner. C.C. Yin - Franchisee Extraordinaire! Come meet, listen and learn from one of the most successful franchise owner ever! C. C. Yin owns and operates over 20 McDonald’s franchises. What are the challenges to owning so many franchises? What do new and starting entrepreneurs need to avoid in starting a new business? What do you need today to succeed as an entrepreneur? Seating Limited – ACT NOW! Click here to download flyer to register. Why Call it Stimulating Change Summit? 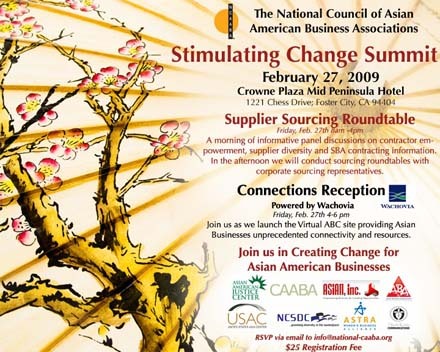 The National Council of Asian American Business Associations (National CAABA) is committed to creating value added and relevant programming for our members and partners. It is this commitment that motivated us to change our previously entitled “Business Partnerships and Connections” event on February 27th at the Crowne Plaza Mid Peninsula Hotel to be named the “Stimulating Change Summit”. Beyond the name change this exciting event has continued to evolve by creating opportunities that will provide you valuable resources such as the Virtual ABC Website and access to sourcing, certification and contract specialists. With this agenda and your participation we intend to be catalysts for change through our summit. National CAABA will continue to listen and act upon the feedback of our constituency by creating value added events for our membership.